The following dates are observed as legal holidays by the District Courts. 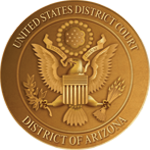 The District of Arizona, U.S. District Court, will be closed on these days. When one of the legal holidays falls on Saturday or Sunday, the office is closed on the Friday immediately preceding or the Monday immediately following, respectively.